I'll be participating in Reading Rambo's Hamilton Readalong for the next two months, so expect weekly (if I can keep up) posts on the book from now through the end of February. Because the story of Hamilton's life is generally known from history books and the musical, I will not be avoiding spoilers in these posts (in other words: if you're planning to read Hamilton and want it to be a surprise, skip along). YOU GUYS THIS BOOK IS SO GOOD. Seriously, if you like well-written, interesting, engaging, incredibly thoroughly researched books that unexpectedly spawned viral musical hits... why are you not reading Hamilton right this very instant? Hot damn, is that a lot to pack into a pay book (also, excellent use of the Oxford comma there, Mr. Chernow). But in just these few chapters, we're seeing the beginnings of all of this: Hamilton becomes a practicing (much respected) lawyer; writes a bunch of political whatsits and whosits (that's the technical term for those, right?) that Chernow posits are the precursors to The Federalist Papers; studies (and writes about) the economy; and, oh yeah, falls in love with (and gets married to) the daughter of a wealthy New Yorker. All of that is fascinating, but what I found most interesting in this section was watching Hamilton the boy grow into the post-war man history remembers most keenly: a brilliant, outspoken, well-written economist-philosopher-leader-voice whose opinions were never in question (as Miranda writes, "I will not equivocate on my opinion / I have always worn it on my sleeve"). I absolutely loved Hamilton's moment of "completely unnecessary bravado," doing parade-ground drills in the midst of besieging the British Army. Major props to Chernow for using "poppycock" in a sentence completely unironically. Maybe it's just because I'm listening to the end of the Hamilton soundtrack as I write this, but can we talk about sad some of this is getting? I was disproportionately upset by the growing rift between Washington and Hamilton over the course of the War. And Laurens' death was fairly soul-crushing. And the increasingly persistent references to duels and dueling! Just, stay away from dueling, Hamilton. I'd like to reach back into history and shake you. "The inquiry constantly is what will please, not what will benefit the people. In such a government there can be nothing but temporary expedient, fickleness and folly." 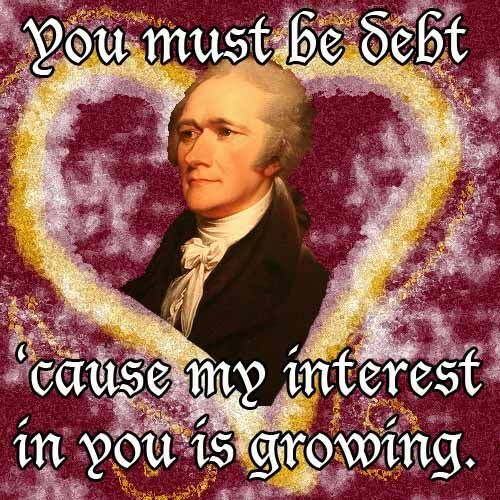 I think Hamilton's a pretty cool dude, but was fairly annoyed by his insistence that Eliza bear him a son. Like there's something wrong with (eldest) daughters. Pssh. So, yeah, that's a lot. And we still have 600 pages to go.